We’ve spent a lot of time watching students of all ages take to SketchUp. Fearlessly, they dive right in, texturing polygons until they’ve created imaginatively robust landscapes, or even autofolding simple geometric structures into mind-bending helixes. Clearly, discerning kids aren’t waiting for permission to explore and design in 3D. We’ve also seen insightful teachers recognize SketchUp’s potential as a teaching platform, but for them jumping into a whole new way of learning isn’t as straightforward. This fall, longtime SketchUp author Bonnie Roskes has introduced a comprehensive (and rather large) guidebook for teaching in 3D. 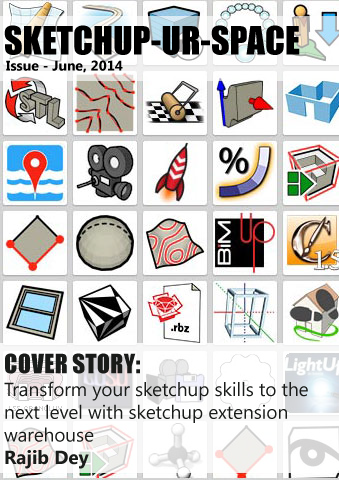 For middle and high school teachers as well as college and university instructors, SketchUp 2013 Hands-On: Student Coursebook bundles basic and advanced exercises, along with step-by-step modeling guides and over 50 “DIY” projects that can be assigned as homework or classwork. Bonnie’s book also includes an Instructor Guide with all the solutions to these projects (so teachers can become 3D experts in step with their students). SketchUp 2013 Hands-on covers all of SketchUp’s tools and features with illustrated, step-by-step instructions. Need to challenge the more advanced modelers in class? Bonnie also provides an add-on guide to 35 popular SketchUp extensions. SketchUp 2013 Hands-on clocks in at 505 pages, so there is a handy PDF version (that is much less expensive) and a better choice for students using the book on laptops or tablets. Bonnie can set you up with an evaluation PDF, or help coordinate discounts for bookstore or group orders: just send her a note. Bonnie has been writing about SketchUp for about a decade now, so we can vouch for both her books and her enthusiasm for helping teachers use 3D to connect and engage with students.